Race to the Pennant is a new, fun way to keep up with the pennant races all summer long! Watch your team as it advances in its division throughout the year, and - hopefully - secures a place in the playoffs. Additionally, dive into the detailed win-loss record of every team, check out recent game results, and compare the teams' recent performance. See who is leading the wild card races all season long. 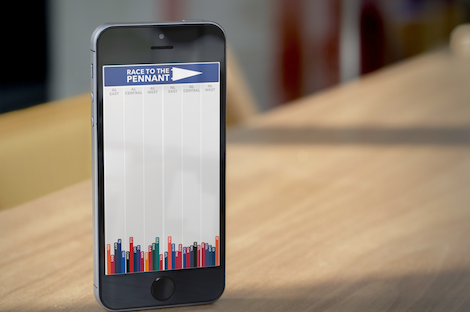 Available as a universal app for iPad, iPhone, and iPod touch, download Race to the Pennant for only 99 cents! Built with pride in Kansas City by Tyler Hillsman.